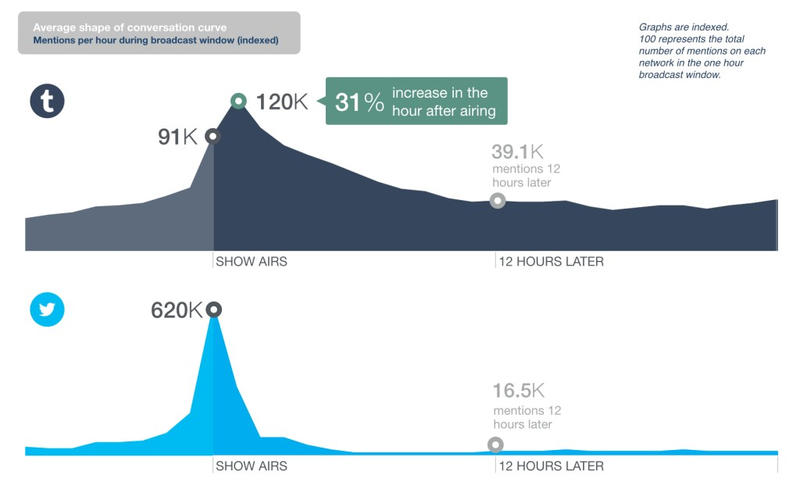 If you have been following the latest in second screen and social TV, you would have seen this interesting study by U.K.-based social-data-intelligence company, Pulsar (commissioned by Tumblr) on the volume of social TV activity post-episode. What’s interesting here is how Tumblr, the Yahoo-owned blogging platform, is enabling users to continue to engage with content after the show has aired - social mentions decline over several days, rather than dropping off precipitously like on Twitter once a show finishes. This naturally adds up to being a far more valuable outlet for brands to engage with their fans, though it should come with a pretty harsh word of warning. The strength of Tumblr has been in the way memes, with 71% of Tumblr TV interactions driven by behaviors related to story telling, creativity and community. These content and trends emerge organically and it’s largely remained free of advertising, corporate campaigns that stifle genuine fan commentary and try to replace it with deferential self praise. Tumblr is an amazing opportunity for content to live beyond its broadcast window, as content created for Tumblr often spreads very quickly into the popular consciousness with a much greater level of sticky-ness than tweets do. But the service will be in danger of ruining itself and turning off its fans if it tries to go down the route of Facebook Twitter to embrace the almighty dollar too much. Campaigns will need to be carefully done and - in part - by fans for fans. With that, and we could have something really powerful on our hands.